The structure of a hemoglobin molecule is almost identical to chlorophyll, with one atom of iron, instead of manganese (or is it magnesium?). I saw the molecule diagrams for them in biology side by side, but I noticed other structural changes besides just that one. We must be related to plants. Well of course we would be. In the beginning, there was cyano-bacteria. It evolved when the atmosphere wasn't oxygen rich like it is today. Stromatolites were the major class of being. Remember, all subsequent life forms are direct or indirect parasites on the activity of the older life forms. So basically, we are at the top of the food chain, but at the bottom of biosphere great chain of being. All hail the master life form, the bacterial reef! 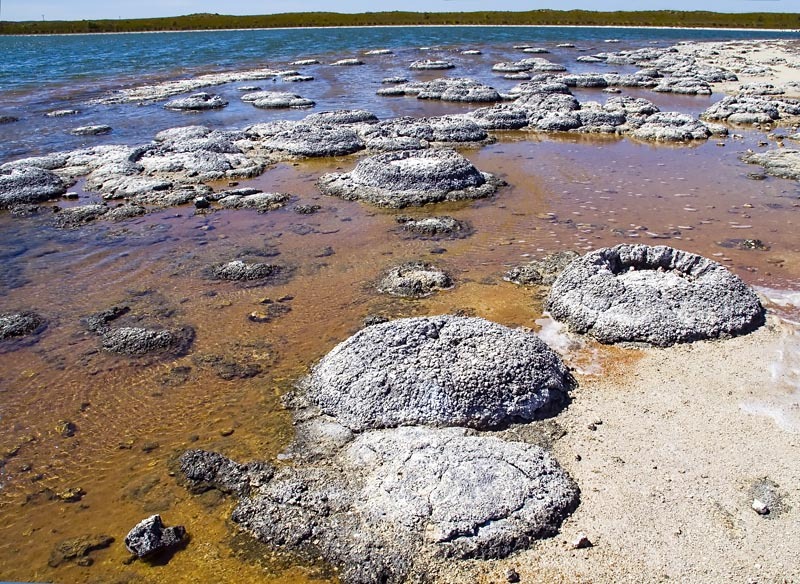 Should we lose oxygen out of the atmosphere, or acidify the oceans too much, stromatolites will once again dominate. Other life forms, not so much. But I think the scorpion will give it a run for its money. Sorry, I just like to write absurd nonsense from time to time. I try to make it absurd enough that people will recognize it's intentionally absurd, but I try to avoid such an extreme so that it might actually sound like something someone might say out of ignorance. Actually, from what I just googled, it's more likely that the evolution seems to be that animals evolved to eat plants, and then evolved some mechanism that uses chlorophyll to manufacture hemoglobin. It was not a detailed enough explanation to explain if the chlorophyll is a catalyst or a building block in the process or exactly how it is used. The part about eating plants first and then using the chlorophyll itself is conjecture on my part. I have no actual knowledge of the order of the evolutionary events. This post showed up on a thread where I wasn't. Admins, check your software! Probably not in nature, but with recombinant DNA we can mix life forms freely. I've posted stuff to threads I never intended to post to, but this mistake has always required that I have been there. Sometimes I've had two different threads on my desk at the same time, and end up writing in one to someone in the other. Usually, it's because I google something to double check it's correct, then I go back to the forum and get the wrong thread. I am an agnostik atheist, also named as ''negative atheist''. Cant say there is no god ''absolutely'' but may be. Depends on how you define it. Do it right, and atheism is like shooting theologians in a barrel (fish in a barrel joke). I do that too sometimes and arrive back at the wrong thread. Heck, at a favorite site long ago, I once discovered I had argued AGAINST MYSELF! You have referred to "negative atheist" before. I used to think that meant someone who hated a deity for some reason, but that never made much sense to me. And you use it differently. I think of "atheist" simply as being without a "theism". Could you describe what you mean in more detail? a- adds negative meaning to the root word. so, etimologically thinking, i too think of atheizm as being with out theizm. why i hate a deity that does not exist? negatif ateists dont comment on whether a god exists. they assert that they simply dont know whethet it exists or not. but pozitif ateists claim there cant be and is not a deity absolutly. I quite agree soldier--why hate a fiction?? I prefer to call myself a non-believer and not an atheist. When I use that label too many theists think I am simply angry at their god. How can I be angry or hate something that does not exist?